View More In Nut & Bolt Assortment Sets. 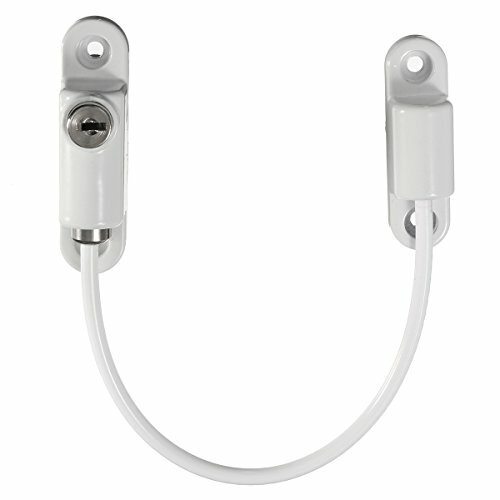 - High quality cable restrictor for extra security and safety! - Designed specifically with child safety in mind. - Safe limitation of your window opening to a maximum of 4 inches(10cm). - Restricts ppening while allowing sufficient ventilation. - Comes with Self drilling flat head screws and wood screws. - Used in homes, residential accommodation, hospitals, schools, universities and offices. - Suitable for various materials, windows and doors. - Can be locked and unlocked in seconds! Insert the key and turn left 90 degrees, and then press the key to unlock the window restrictor. 1. Deadlocked position: insert and turn the key a further 90 degrees so the key slot is in line with the body. Withdraw the key to leave the restrictor deadlocked. 2. Push to release position: with the key slot at 90 degrees, the bullet can be withdrawn when the key button is depressed. High quality cable restrictor for extra security and safety!